MS SQL Server database corruption – how to identify and fix? MS SQL Server, a Relational Database Management System developed by Microsoft, is widely being used by a great number of businesses to store their professional details. SQL has different editions that meet the requirements of clients ranging from small-size enterprises to large-scale corporate giants. The memory disk’s subsystems which store the database details may get affected by various issues. It will lead to the improper arrangement of table details in the database and ultimately the user will not get the desired information he is looking to retrieve. Software bugs also can also cause SQL corruption. Anti-malware and anti-spyware are good for other files stored on the system, but they can be harmful for the SQL. That is why it is advised to exclude database from anti-virus scans. Many users like to compress the database to save some space. But the database files are not meant to be compressed. It may increase the chances of corruption. Keeping backup files in a compressed database also increases the chances of database corruption. If the user really wants to compress the database file, then he must use the in-built data compression and backup tools present in the SQL Server. The corruption in SQL Server is much more dangerous as it does not give any notification or error message regarding any corruption until the user tries to fetch the data. So the user may remain unaware of any issue in the database. There is a very general single line query to check the corruption in the database – SELECT * FROM msdb.dbo.suspect_pages. If there is no error in the database, then the result will show no rows. It means that it did not find any corrupted entry. However, it does not mean that there could be no corrupt data as the query only checks those entries which had a corruption in the past. Any corruption in a newer entry will not be checked. A proper thorough checkup is required to find undetected issues. This command will check the tables, storage, quality, and consistency measures and will bring the outcome in a list. If there is any shortcoming, discrepancies, and corruption, then it will be in front of you. Transact SQL cmdlets may not be effective with severely corrupted databases. There is a chance of data loss too. In serious cases of SQL corruption, only efficient third-party Repair MDF tool will be of help. 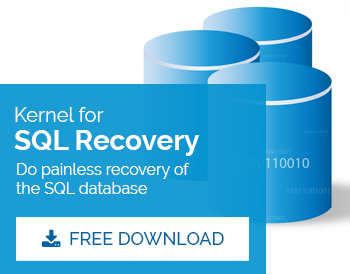 Kernel for SQL Database recovery has been developed to help the businesses to regain their critical business data from SQL databases. It retrieves all the objects of database (including tables, triggers, and procedures) without losing the relationship schema. It’s a user-friendly tool too.